The White House Hotel Guilin is located in the heart of downtown Guilin on the banks of Xiqing Lake, near all the city's major attractions, such as Gunanmen Gate, and the Sun and Moon Twin Pagodas. The hotel is also situated 40 minutes by car from the airport. The White House Hotel Guilin has 37 comfortable and bright guest rooms featuring elegant décor, crisp white linens, and fine wood furnishings. Each very spacious room comes equipped with a large private bathroom, LCD TV, air conditioning, mini bar, desk, balcony, and free wireless internet access. Guests will enjoy the hotel's various recreational facilities, including a Jacuzzi, massage services, spa with beauty treatments, modern fitness center. The hotel also offers meeting facilities, business center, babysitting, a full-service bar with lounge, and a fine dining restaurant serving regional and international cuisine with available 24-hour room service. The White House Hotel Guilin in Guilin! The Guilin Silver Terraces Hotel is located in the lush mountains outside of Guilan. Situated 90 km from the city center and 100 km from the airport, the hotel is a great place to experience the wonderful natural beauty of cascading valleys and escape the busy city. Guilin Silver Terraces Hotel has 31 comfortable guest rooms featuring simple rustic décor. Each room comes equipped with a private bathroom with shower, air conditioning, satellite TV, and free wireless internet access. Guests will enjoy the rustic appeal of the hotel and scenic views of the countryside, while taking advantage of amenities such as a full-service bar, airport transfer, guided tours, and a restaurant featuring traditional regional cuisine and 24-hour room service. Guilin Silver Terraces Hotel in Guilin! 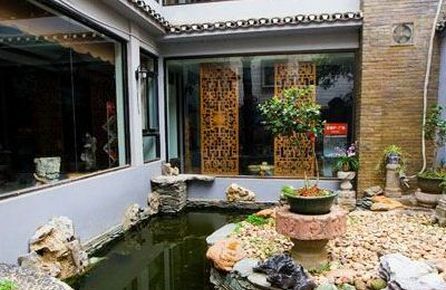 The Guilin Han Tang Xin Ge Hotel is located in the city of Guilin, just 1.5 km from the shops and restaurants of downtown. The hotel is situated within walking distance to Xihu Lake, Sun & Moon Twin Pagodas, and 2 km from Guilin Train Station. 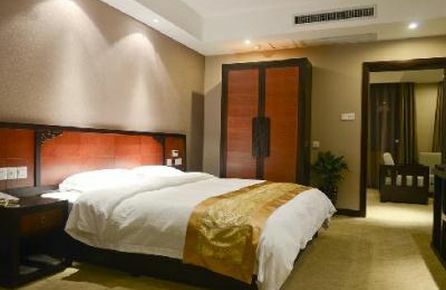 Guilin Han Tang Xin Ge Hotel has 51 spacious and comfortable guest rooms featuring contemporary décor and modern amenities. Each bright room comes equipped with a private bathroom with shower, desk, TV, complimentary bottled water, and free wireless internet access. Guilin Han Tang Xin Ge Hotel has a host of wonderful features for guests to enjoy, including shops for souvenirs, relaxing family room, local shuttle service, guided tours, 24-hour front desk with concierge service, and a restaurant serving gourmet regional cuisine with available 24-hour room service. Guilin Han Tang Xin Ge Hotel in Guilin! 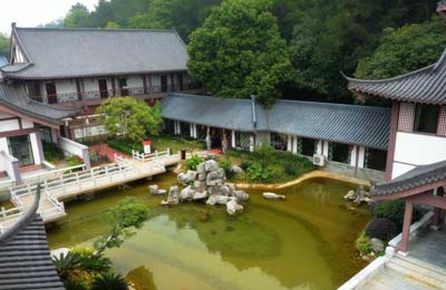 The newly renovated Guilin JIngGuanMingLou Museum Hotel is located in a quiet area of the Lake District in downtown Guilin, just 1.5 km from the local train station and 25 km from Guilin International Airport. The hotel is also situated a short walk from popular attractions such as the Sun and Moon Twin Pagodas, Elephant Trunk Hill, and the Guilin Department Store. 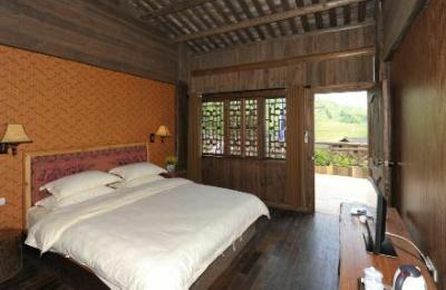 Guilin JIngGuanMingLou Museum Hotel has 21 bright and spacious guest rooms featuring classic décor and comfortable furnishings. Each guest room comes equipped with a private bathroom, seating area, TV, and free wireless internet access. 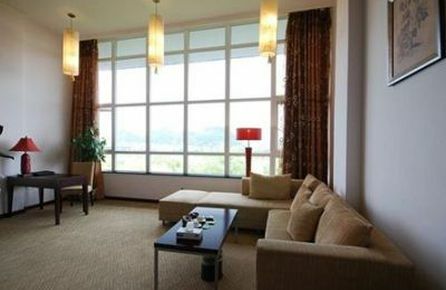 The Guilin JIngGuanMingLou Museum Hotel offers many facilities and services for guests to enjoy, including a convenient 24-hour front desk with concierge service, shared TV lounge, business center, meeting facilities, guided tours, and a restaurant with 24-hour room service featuring regional and international cuisine. Guilin Jingguanminglou Museum Hotel in Guilin! The Guilinyi Royal Palace is located in the scenic city of Guilin, just 5 km from the center of town and 2 km from both Elephant Trunk Hill and the Guilin Department Store. The hotel is also situated within walking distance from the train station and 24 km from Guilin International Airport. Guilinyi Royal Palace has 52 well-appointed guest rooms featuring classic contemporary décor and modern amenities. Each comfortable and spacious room comes equipped with a private bathroom, TV, ironing facilities, and free wireless internet access. Guest of the Guilinyi Royal Palace will find no shortage of facilities during their stay, including an outdoor swimming pool, beautiful gardens, fitness center, business center, BBQ facilities, coffee shop, gift shops, and a restaurant serving regional cuisine with available 24-hour room service. The hotel also offers a concierge service, currency exchange, babysitting, and guided tours for guests who like to explore the city and surrounding area. Guilinyi Royal Palace in Guilin! The Leader Guest House Longji Branch is located in the lush mountains outside of Guilan. Situated 90 km from the city center and 100 km from the airport, the hotel is a great place to experience the wonderful natural beauty of the cascading valleys and escape the busy city. Leader Guest House Longji Branch has 24 comfortable guest rooms featuring rustic décor and simple furnishings. Each room comes equipped with a private bathroom and free wireless internet access. Guests will appreciate the hotel's peaceful natural setting with stunning views of the countryside and variety of modern amenities, including a business center, laundry service, coffee shop, full-service bar, and a restaurant serving regional cuisine with 24-hour room service. Leader Guest House Longji Branch in Guilin! 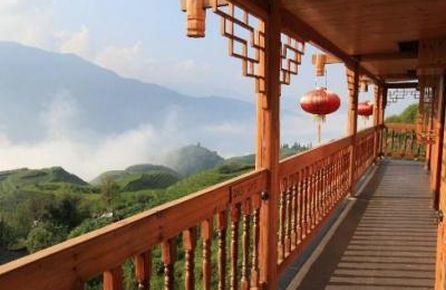 The Longji Star-Wish Resort is located in the lush mountains outside of Guilan. Situated 90 km from the city center and 80 km from the airport, the hotel is a great place to experience the wonderful natural beauty of the cascading valleys and escape the busy city. Longji Star-Wish Resort has 21 comfortable and spacious guest rooms featuring simple traditional Chinese furnishings and décor. Each bright room comes equipped with a private bathroom and free wireless internet access. Guests of the Longji Star-Wish Resort will appreciate the picturesque views of the valleys and variety of modern amenities, including guided tours, laundry service, coffee shop, full-service bar, and a restaurant serving regional cuisine with 24-hour room service. The hotel also features a private beach, massage services, and a tranquil garden to relax after a long day. Longji Star Wish Resort in Guilin! 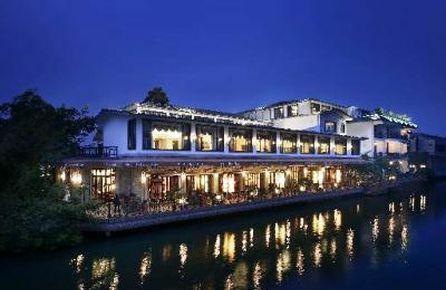 The Eva Inn Hotel is located in the River District of downtown Guilin, on the shores of the Li River. The hotel is very close to the business area of Zhenyang Street, where some of the city's best dining, entertainment, and shopping options are located. The hotel is also within walking distance to Elephant Trunk Hill and Chuan Shan Hill, and just 26 km from Guilin Liangjiang International Airport. Eva Inn Hotel has 113 comfortable and well-appointed guest rooms, each featuring a private bathroom, desk, TV, sitting area, and free wireless internet access. Guests of the Eva Inn Hotel are encouraged to make use of the hotel's fine facilities including massage services, relaxing sauna, spa with beauty treatments, shops for souvenirs, guided tours of local sites, and a business center. The hotel also features a coffee shop, full-service bar with patio, and a restaurant serving delicious regional and international cuisine. Eva Inn Hotel in Guilin! 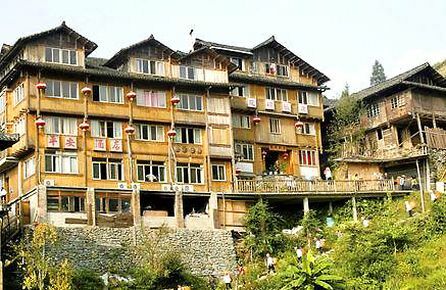 The Guilin Longji Titian Tianranju Inn is located in the lush mountains outside of Guilan. Situated 90 km from the city center and 105 km from the airport, the hotel is a great place to experience the wonderful natural beauty of the cascading valleys and escape the busy city. 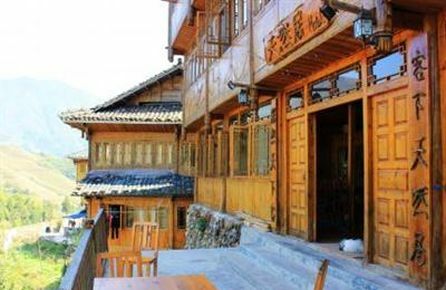 Guilin Longji Titian Tianranju Inn has 14 comfortable guest rooms featuring rustic décor and furnishings. Each room comes equipped with a private bathroom with shower, satellite TV, desk, and free wireless internet access. Guests of the Guilin Longji Titian Tianranju Inn are welcome to take advantage of the hotel's various features, such as a 24-hour front desk, guided tours of the local sites, luggage storage, coffee shop, and restaurant serving traditional regional cuisine. Guilin Longji Titian Tianranju Inn in Guilin! The newly built Guilin Zizhou Four Season Resort is located in the sports and business area of the beautiful city of Guilin, near the International Expo Center and just 3 km from the center of town. The hotel is also situated 30 km from the Guilin Liangjiang International Airport. 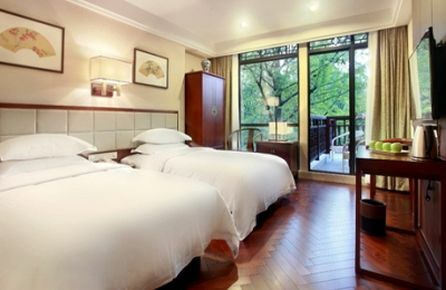 Guilin Zizhou Four Season Resort has 14 bright and spacious guest rooms featuring elegant modern décor, crisp white linens, and hardwood floors. Each bright room comes equipped with large windows, private bathroom with bathtub, sitting area, desk, LCD TV, and free wireless internet access. Guests are encouraged to take advantage of the hotel's various amenities, including meeting facilities, lounge area, laundry service, beautiful gardens, coffee shop, and restaurant serving delicious gourmet regional cuisine. Guilin Zizhou Four Season Resort in Guilin!